When I was in college my mom sent me a DVD of a movie called Tortilla Soup, and to this day I still don’t really know why. 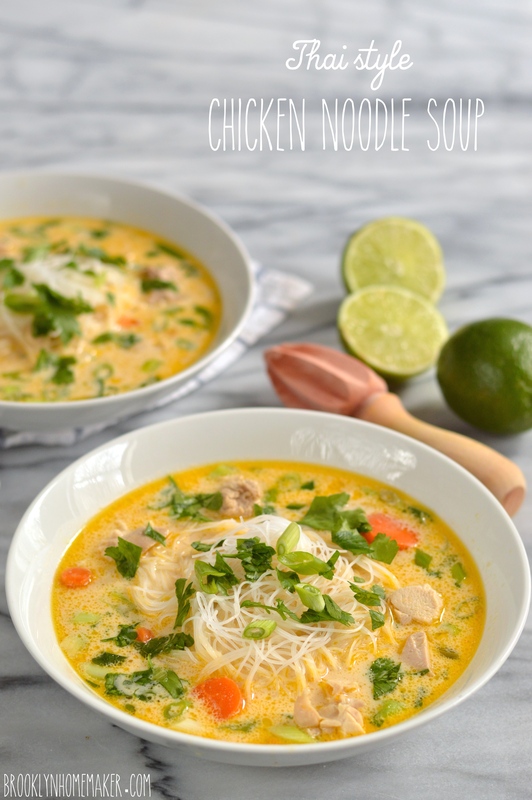 I was really into cooking even then, and I was taking a few culinary courses for my degree, but as far as I understand it my love of cooking was reason enough for Mom to think I’d LOVE a movie about soup. She’d apparently rented it, liked it, and since it was about cooking, thought I’d like it too. Rather than telling me to rent it for myself though, she bought a copy and mailed it to me. I’d never heard of the film, and having lived a pretty culturally sheltered life, I’d never heard of the soup either. It took me a while to get around to actually watching it, and when I did I found it pretty unremarkable. I liked it okay, and I told mom so, but I never watched it again and today I have little memory of what it was even about (besides soup). 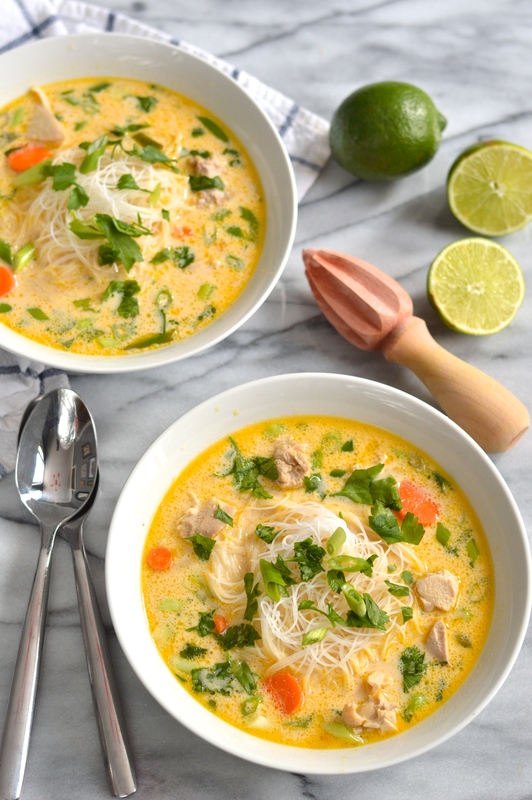 A few years ago, when I started my first recipe based pinterest board, I started seeing recipes pop up for this soup that I’d largely forgotten all about. Suddenly my interest in the soup (but not the film) was sparked anew. 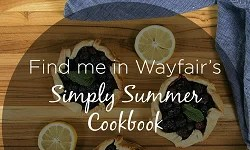 The only problem was that whenever I clicked on any of the recipes, most of them called for loads of canned ingredients and seasoning packets and other fun concoctions loaded with sodium. While the idea of the soup sounded good, the recipes I was seeing never looked good enough to bother. Then, earlier this summer the siren song of New York’s Green Markets got the better of me and I suddenly found myself wanting to put sweet corn and tomatoes and peppers in everything. It seemed like the time was just right and I needed to finally make it happen. 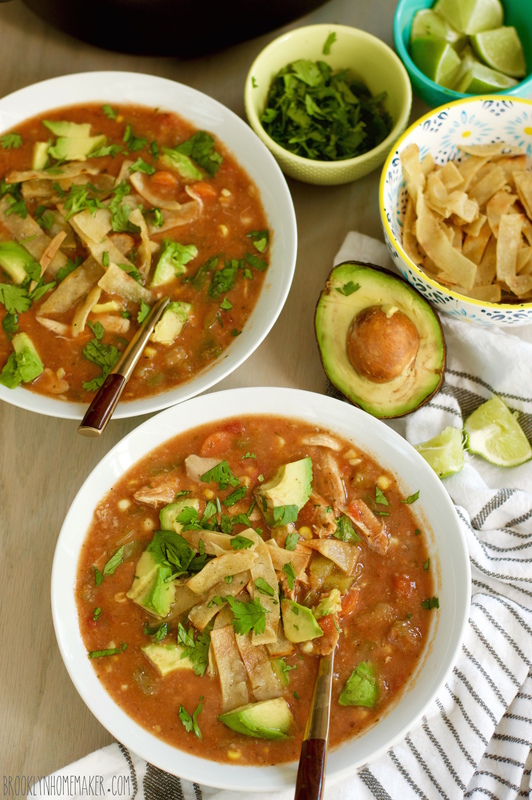 I searched the internets for tortilla soup FROM SCATCH (I don’t know why it never occurred to me to do this before) and finally found one that sounded great. The first recipe I tried was overflowing with tons of vegetables and only called for one canned ingredient: crushed tomatoes. I know it’s tomato season right now but I really hate peeling them so I’ll save the fresh ones for tomato sandwiches and reach for the can when it comes to soups. Anyway, this soup was absolutely delicious but the torn corn tortillas used for thickening didn’t break down enough for me and just seemed kind soggy and weird. I mentioned this to a friend who, unbeknownst to me, turned out to be a tortilla soup connoisseur. 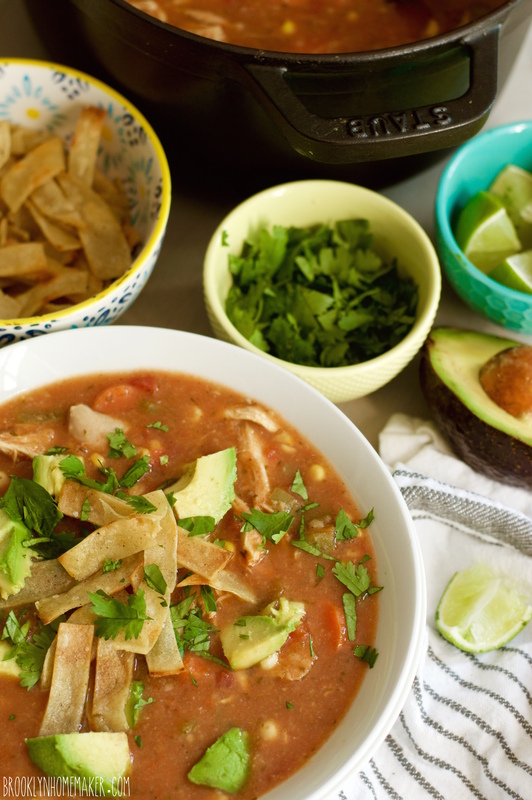 She told me that she’d recently learned the trick to making what was now her favorite “authentic” tortilla soup. I assumed this would be some time tested family recipe handed down through generations and just passed on to her by her great aunt, but when I asked for the recipe instead of a stained and faded recipe card she sent me an email with a link. 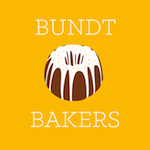 A link to a recipe from ABC’s “The Chew”. The main difference here is that rather than just tearing and tossing the tortillas in to the soup to break down and thicken, they’re ground up in a blender with some stock and onions. That would definitely solve the soggy tortilla chunk issue, and would probably make for a thicker soup, so I decided to give it a go. If it was good enough for my friend, it was good enough for me. Rather than just using the recipe as is though, I decided to just steal the thickening technique and use it along with all the fresh veggies from my first recipe. Oh boy oh boy. This recipe sure is a keeper. 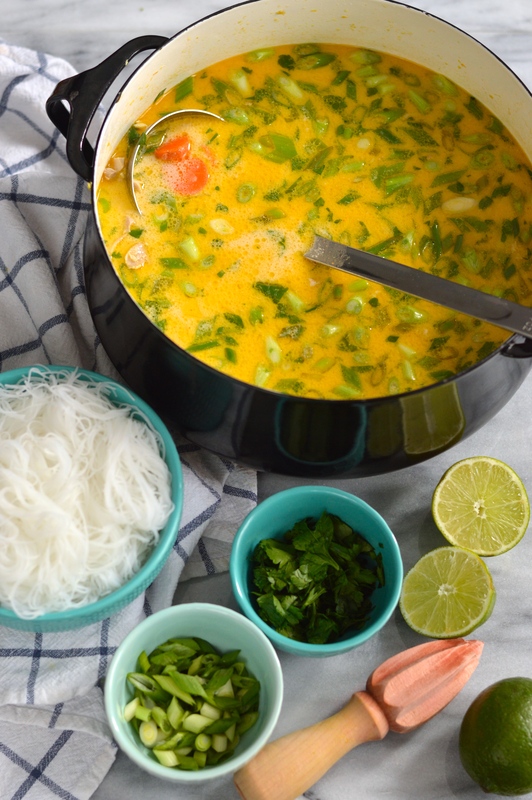 I definitely see why someone might want to make this in the slow cooker in the dead of winter using a bunch of canned goods and salt, but you’ll never beat how amazing this soup can be when made with super fresh ingredients in the height of summer. By the way, this is a perfect way to put some of your end-of-summer produce to good use. The soup itself is rich, hearty, and loaded with fresh vegetables. 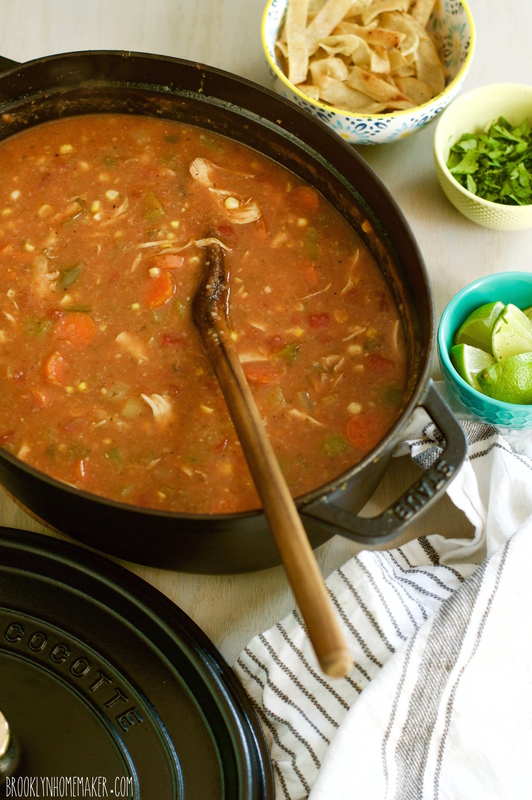 The broth is thick and tomatoey, with just a touch of heat from the jalapeño. A squeeze of fresh lime juice and sprinkle of chopped cilantro really add a wonderful brightness to everything. 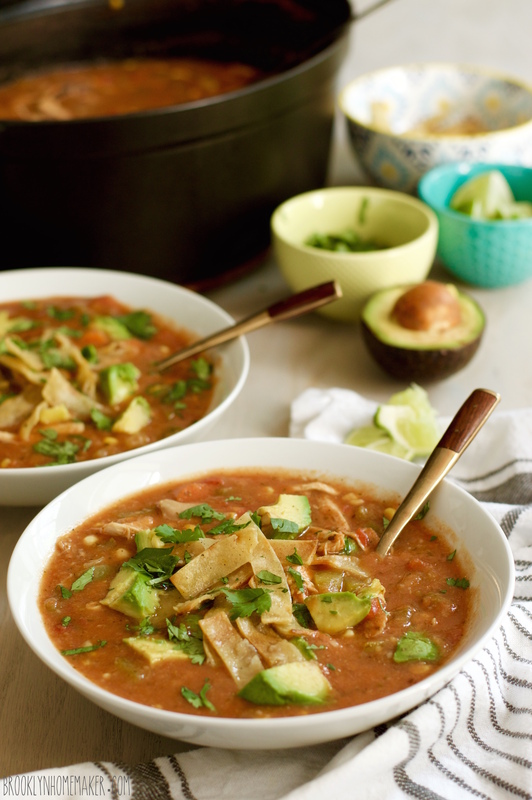 I know most people like to finish tortilla soup with grated cheese and sour cream, but I think a few slices of ripe creamy avocado are all that’s needed to make this soup feel rich and decadent. 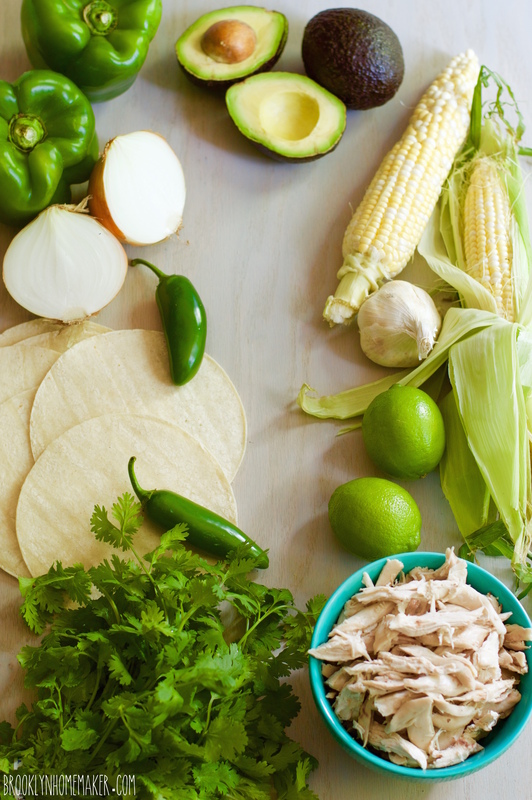 Of course, the crunch of a few crispy tortilla strips can’t hurt either. Heat 2 tablespoons of olive oil a large heavy bottom stock pot or dutch oven. Add corn kernels, celery, carrot, and bell pepper. Season with salt and pepper and sauté for about 10 minutes. or until vegetables are beginning to soften and get some color in the pan. Transfer to a bowl and set aside, scraping everything out of the pan. Heat 2 more tablespoons of olive oil in the same pan and add onion, garlic, jalapeño, & cumin. Season with salt and pepper and sauté for about 5 minutes. Add 1/4 cup of cilantro leaves and sauté for 5 minutes more, or until onions are soft and translucent. Scrape onion mixture into the pitcher of a powerful blender and add about 1 cup of chicken stock and 3 to 4 torn up corn tortillas (depending on how thick you want the soup). Purée the mixture until well blended and free of lumps. Transfer back to the pan and heat until it bubbles and just begins to thicken. Add crushed tomato, chicken stock, and cooked vegetables from before. Bring to a boil, reduce the heat, and simmer for 10 minutes. Add cooked chicken and cook for 10 minutes more. 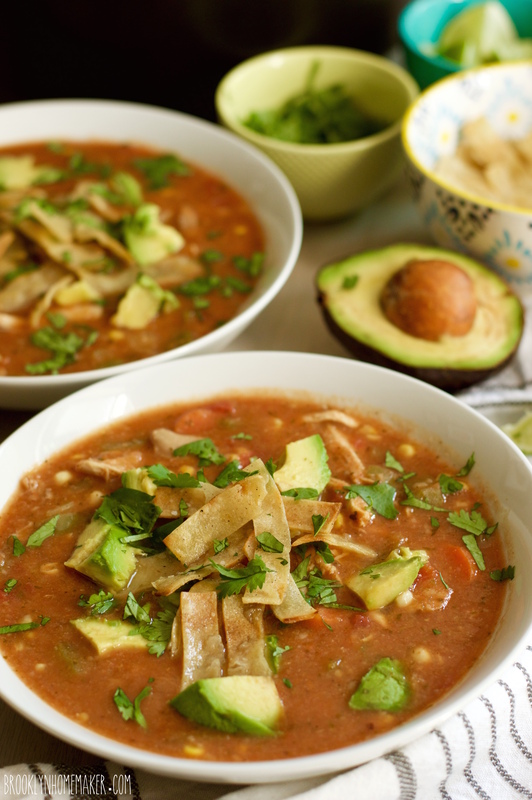 While soup simmers you can make your tortilla strips by slicing 6 remaining tortillas into strips and crisping in a cast iron skillet over high heat with 2 to 3 tablespoons of olive oil. 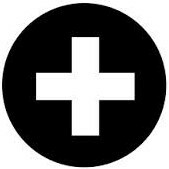 Stir very frequently and try to promote even browning. Once well browned and crisp transfer to a paper towel and sprinkle with salt. Alternatively, you could just crunch up a few tortilla chips. 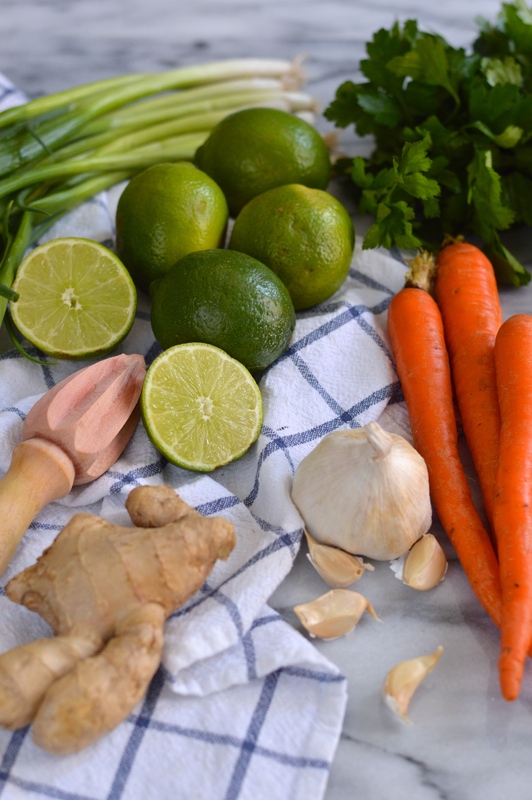 Serve the soup with a squeeze of fresh lime juice, a sprinkle of torn cilantro leaves, a few cubes or slices or avocado, and a few tortilla strips. Spring is finally in full swing and the dogs and I are over the freaking moon. While the trees are bursting with buds and daffodils are blooming like it’s their job, local produce hasn’t seemed to catch up just yet. New York’s farmers markets boast plenty of local meat and dairy, and tables overflowing with brightly colored annual flowers, but sweet juicy berries and bright green vegetables still need a few weeks to soak up the warm sunshine. True to form, this spring has been toying with me and my frail emotions. Temperatures one day are soaring into the 70s, and the next they’re dipping back into the 40s. One day we have ample sunshine, the next it’s pouring rain. On one of the cold and rainy days I was craving soup, as one does. With no local produce to choose from, I was off to the grocery store to try to find something fresh-ish and hopefully organic that I could turn into a warm satisfying soup. I also had a healthy stash of amazing Irish cheddar that was leftover after a book signing event at work, so I wanted to try to incorporate some of that cheesy goodness. It didn’t take me long in the produce aisle to come up with a plan. 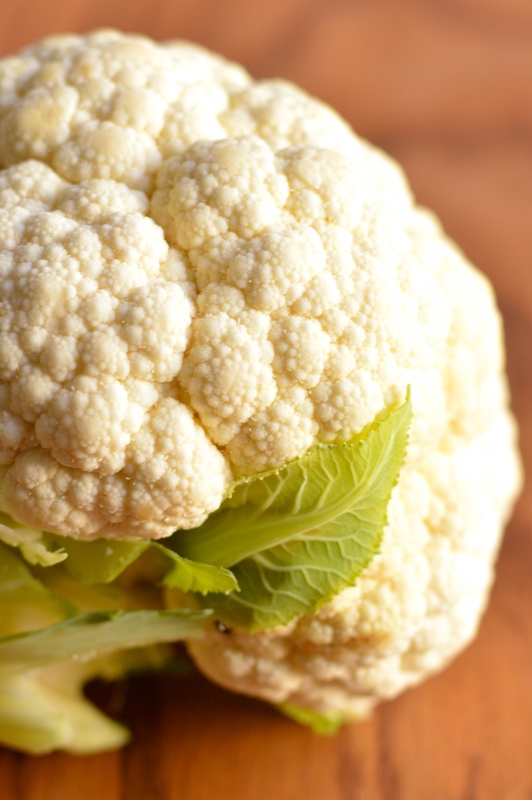 What better vegetable for a thick warm filling soup than cauliflower? It’s available year round, goes great with cheddar and warm flavors, and is perfect for a rich and roasty soup. 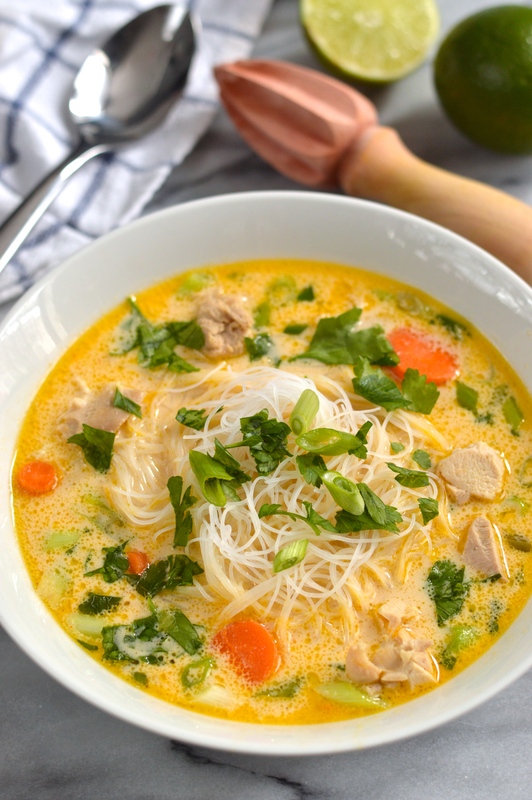 This soup is really simple to make and definitely hits the spot on a rainy day, no matter what time of year. The fresh woodsy thyme adds a touch of green herbal freshness, and the white wine adds a crisp brightness that feels very appropriate for spring or summer. Roasting the cauliflower before pureeing it deepens and concentrates its earthy flavor, and the sharp cheddar adds a nice zippy tang without feeling heavy or overwhelming. Pull up a bowl, tear into a nice crusty loaf of bread, and park yourself in front of the window and watch the rain come down. Preheat oven to 400. 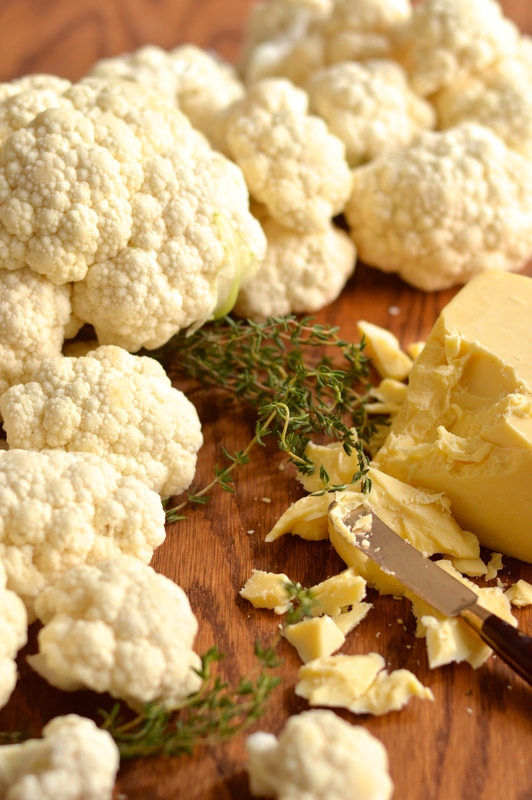 Chop cauliflower into rough large florets. Toss in olive oil, season with salt and pepper, and arrange in a single layer on a parchment lined baking sheet. Roast until brown and golden, about 30 or 40 minutes. Preheat a stockpot over medium high heat and bring butter to a sizzle. Add onion, cayenne, paprika, thyme, and salt and pepper to taste. Sauté until tender and translucent, 5 to 10 minutes. Add white wine and reduce by at least half. Add chicken stock and bring to a boil. Add roasted cauliflower, bring back to a boil, and cook for 10 minutes. Remove from heat and remove thyme sprigs. Add cheddar and puree until silky smooth, using either an immersion blender or working in batches in a standing blender. Taste and adjust seasoning if necessary. 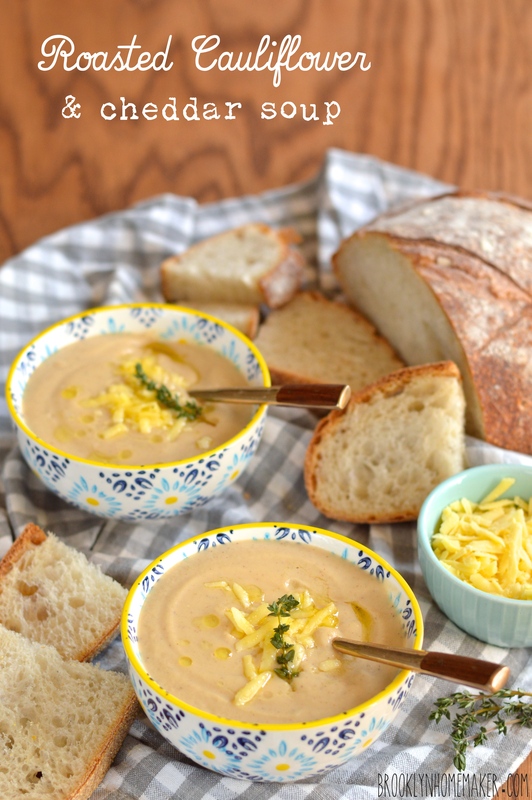 Serve with a drizzle of olive oil, a small handful of grated cheddar, and a big hunk of crusty bread. I’ve been craving some good old fashioned cream of mushroom soup for weeks. When I was growing up I had two working parents, so a lot of my afternoons were spent at my grandmother’s house out in the country in upstate New York. We always ate really well (too well, probably) at Grandma’s house, and lunch was always a big deal. Soup and sandwiches was a pretty popular lunch time menu, but I hated tomatoes when I was young so mushroom soup (from a can of course) was how I rolled. I don’t know what kid likes mushrooms but not tomatoes, but what can I say. I was a weird kid I guess. When I think of all the gorgeous tomatoes that I missed out on, grown in the bright sunshine of my grandfather’s garden, it makes my heart ache. What was wrong with me? What a sad boring life I led. One of my great grandmother’s favorite lunches in the summer was a thick-sliced fresh tomato sandwich on white bread with a little mayonnaise and a generous sprinkle of salt. I, however, usually opted for velveeta grilled cheese (baked, not fried) with a bowl of cream of mushroom soup. 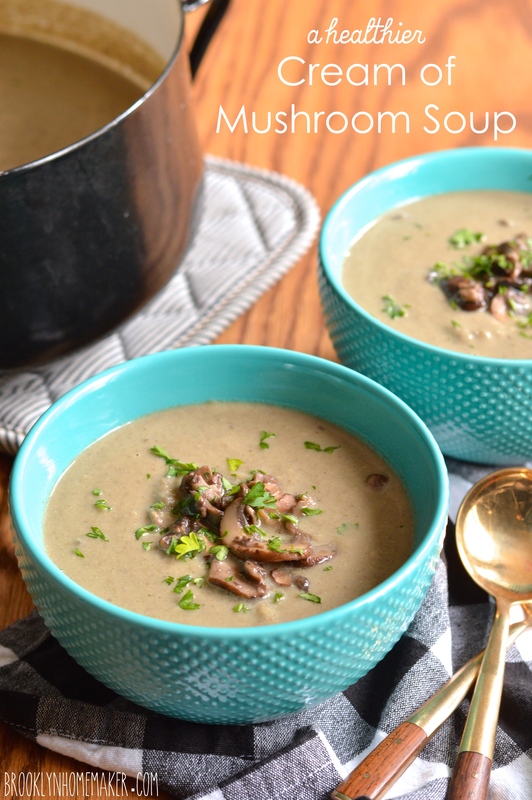 Mushroom soup has always felt like a perfect comfort food ever since. 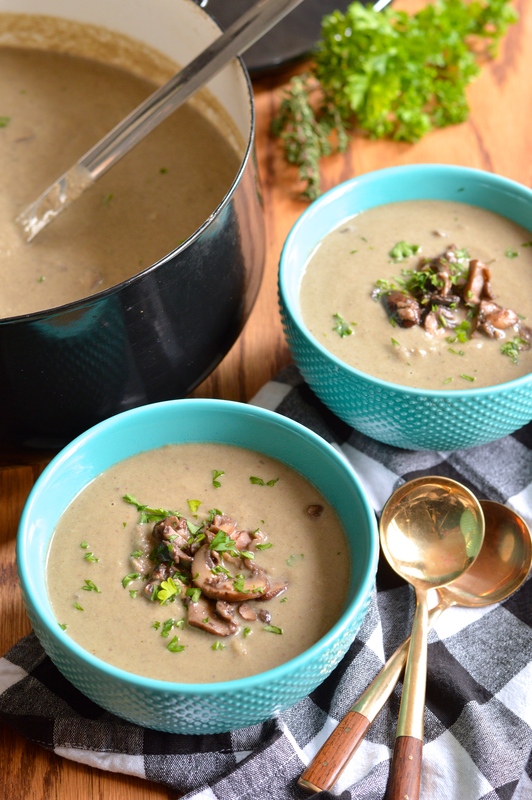 I recently dug around for recipes to satisfy my mushroom soup cravings, but I was stopped dead in my tracks by how heavy most of them sounded. I’m sure you know by now that I’m not shy about using real butter and cream, but Jeez Louise! One recipe, from my best-friend-in-my-head Ina Garten, called for a whole stick of butter, a cup of half and half, and a cup of heavy cream! 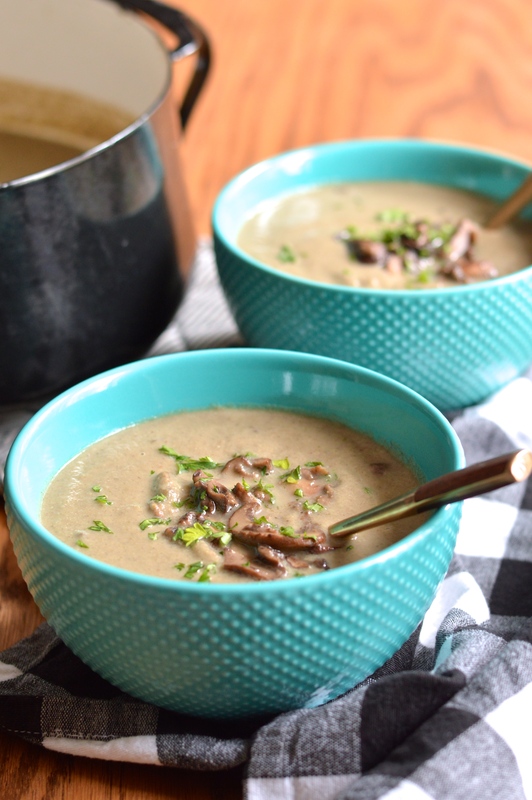 I knew there had to be a way to make a silky, creamy, rich & hearty cream of mushroom soup without using that much dairy and fat, but was having a hard time figuring it out. Then a friend at work reminded me that I already know the perfect secret ingredient! Aaaaaaaaawwwwwhhhhh! Look at how that beauty glows! Can you hear the angels singing? I’ve already used this trick before, when making corn chowder this summer, and I guess I somehow just forgot about it. When I was whining about how heavy and fattening homemade cream of mushroom soup was, my friend was like, why don’t you just do that roasted cauliflower trick? Roasting cauliflower in the oven, rather than boiling it with the rest of the soup, keeps it from tasting cabbage-y, and once pureed super smooth, it adds an unbelievably silky texture that you’d truly never guess didn’t come from cream thickened with a roux. I don’t even understand how or why this works so well, but it really does. I wasn’t intending to make a vegetarian or vegan cream of mushroom soup, just a lighter version, so I went ahead and kept the chicken stock and (some of) the butter. I also intended to add in just a bit of milk or cream at the end, but once the roasted cauliflower was pureed in, I realized I didn’t even need to. With that in mind, I now realize that it would be really easy to make this soup vegan if you want to. Just substitute olive oil or coconut oil for the butter, and vegetable (preferably mushroom) stock for the chicken stock. 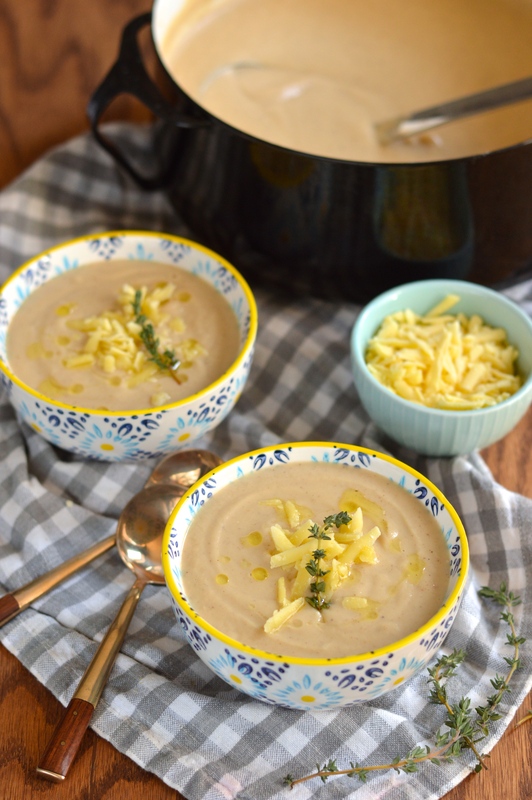 Since cauliflower is the only thickening agent, this soup also happens to be totally gluten free! 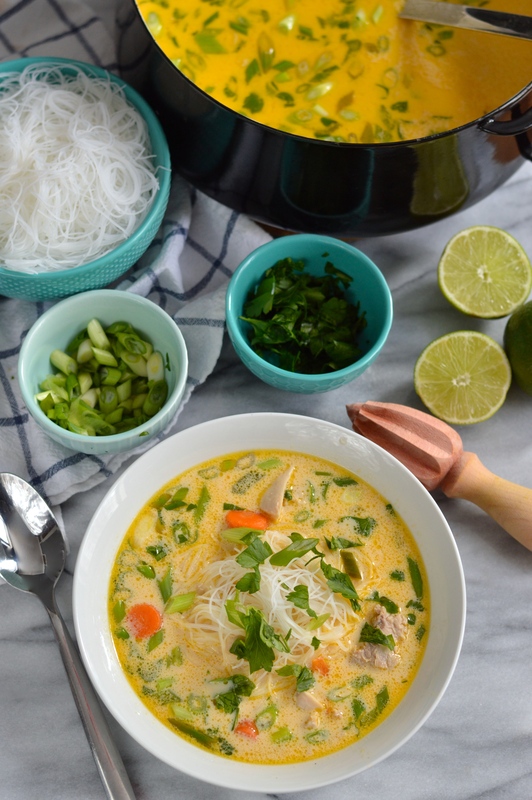 This soup is just what the doctor ordered. 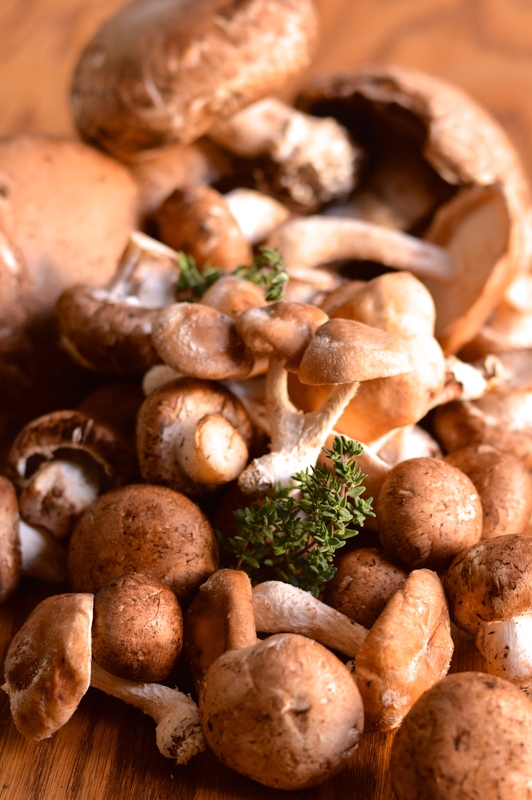 It’s so earthy and rich and… mushroomy. 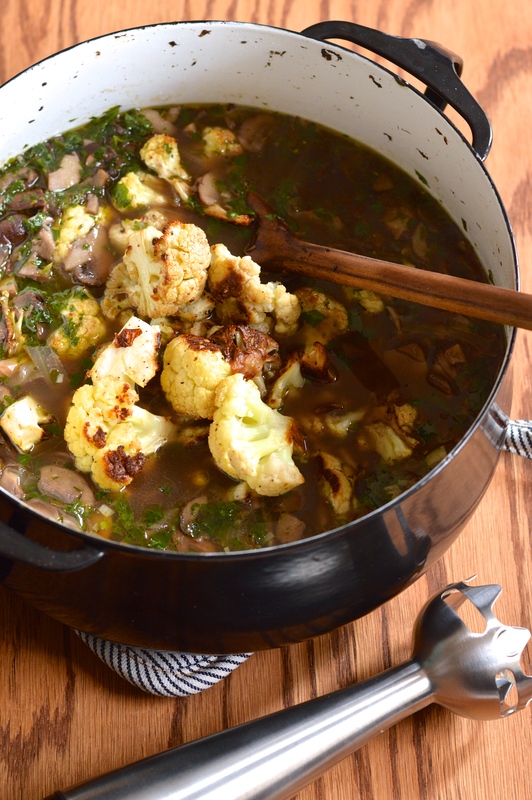 Using three varieties of flavorful mushrooms makes sure that every bit packs a serious punch. 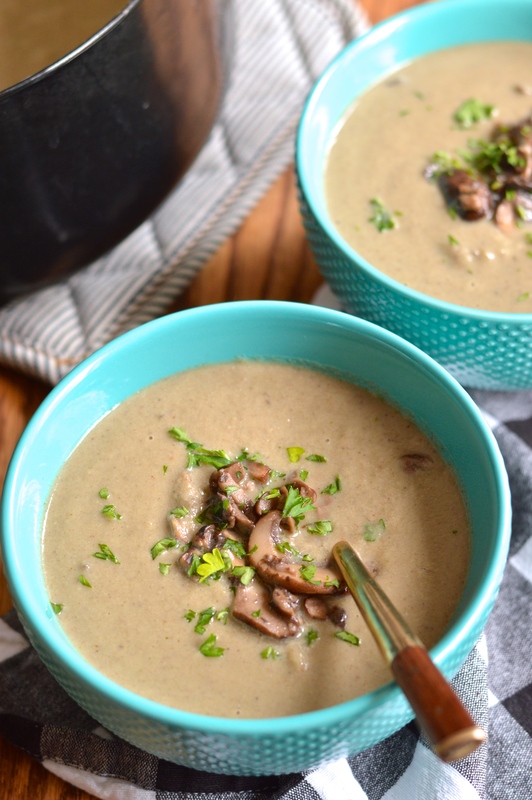 White wine adds a luxe floral note, fresh thyme compliments the woodsy earthiness of the mushrooms, and fresh parsley finishes the soup with bright green herbal flavor. 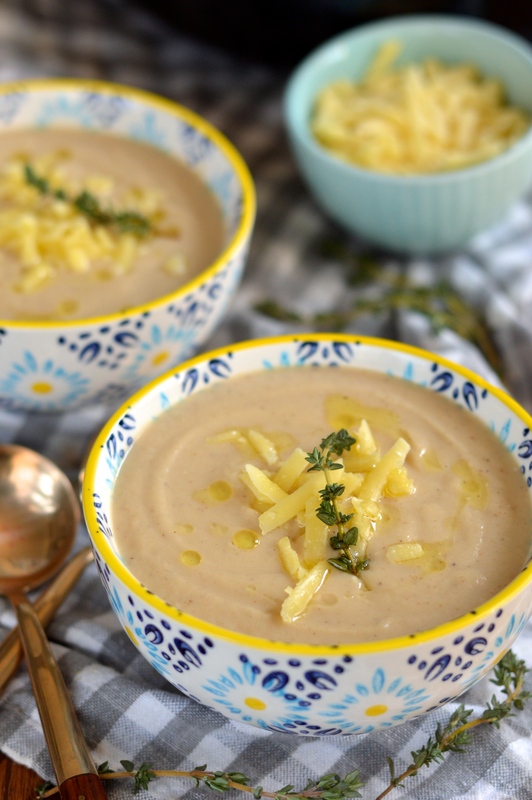 While this recipe is healthier than most, I would never call it a “diet” or “light” recipe because it tastes way too good to be “health food”, and because it does still call for a good bit of butter and olive oil. 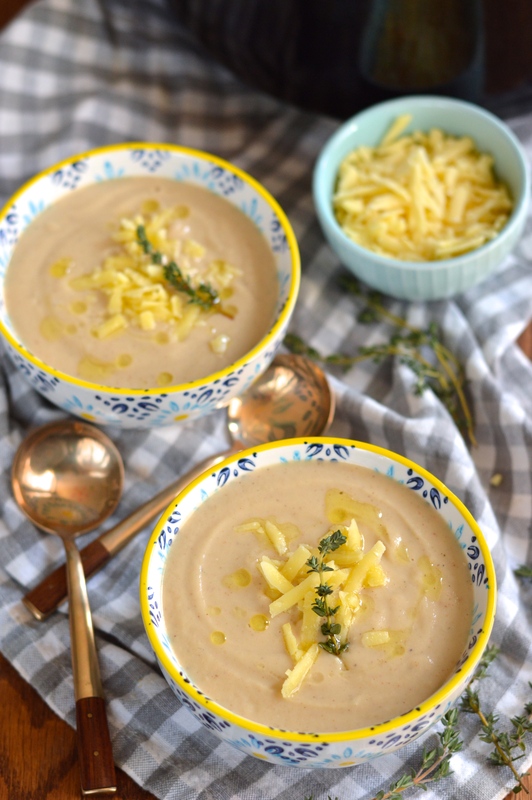 Thanks to the pureed roasted cauliflower, this soup feels every bit as rich and satisfying as you could hope. Some of the mushrooms are pureed too, but I like to reserve a few so you get some meaty bites of them every so often. 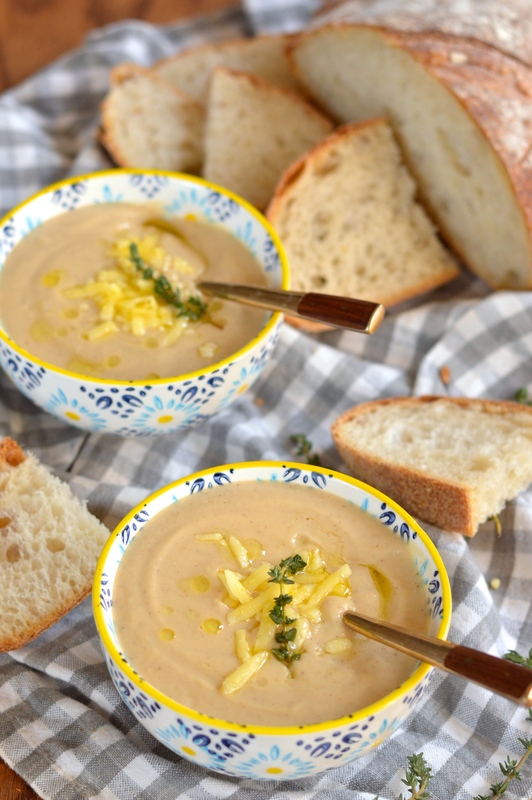 You can use an immersion blender or a standing blender to puree the soup, but I will say that a standing blender seems to get the soup just a bit more smooth and silky. I used an immersion blender though, because it works almost as well and just seems safer, easier, and less messy. Preheat oven to 400 F. Roughly chop cauliflower into large florets. Toss in 1 tablespoon of olive oil, season with salt and pepper, and arrange in an even layer on a parchment lined baking sheet. Roast for 30 minutes and set aside to cool. Meanwhile, roughly chop your mushrooms, removing and discarding any thick woody stems (especially the stems of portabello and shiitake). Heat butter and remaining 1 tablespoon olive oil over medium high heat in a large thick-bottomed pot. 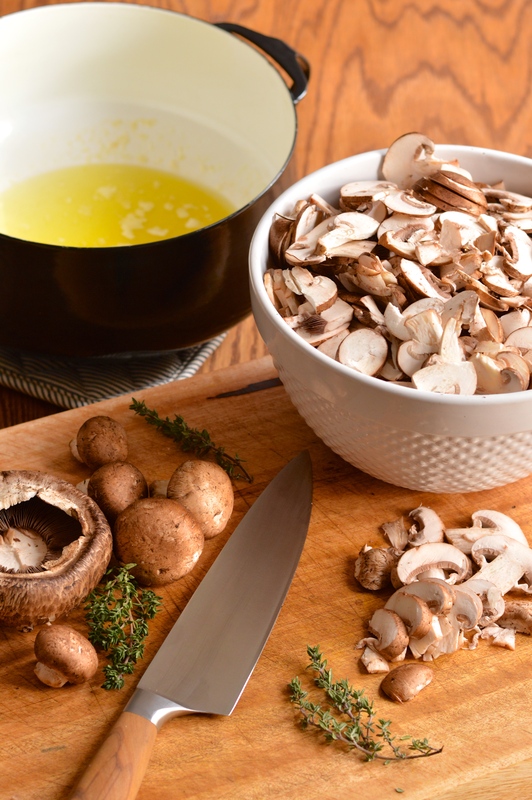 Once the butter is sizzling, add the mushrooms and thyme, lightly season with salt and pepper, and stir to coat. Cook the mushrooms until they have released most of their liquid. Remove two cups of the cooked mushrooms, letting liquid drain back into pot, and set aside. Add the onions and the garlic, and cook for about a minute. Add the white wine, chicken stock, and half of the chopped parsley. Bring to a simmer and cook, uncovered, for 15 minutes. Remove from heat and add the roasted cauliflower. Using an immersion blender or working in batches with a standing blender, purée the soup until completely smooth and silky. Return the pot to the stove, add the reserved cooked mushrooms and remaining chopped fresh parsley. 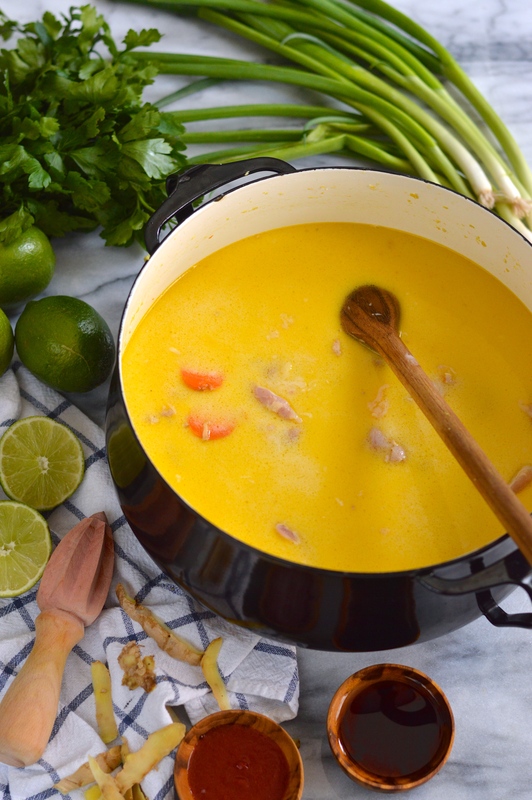 If the soup is too thick, add a bit more stock to thin to the desired thickness. Taste and adjust seasoning if necessary and bring back up to a simmer before serving.